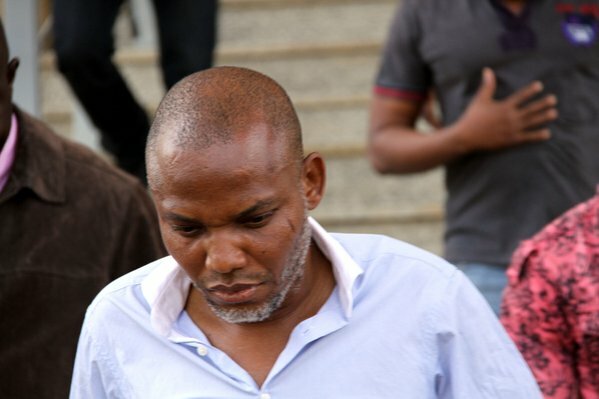 The leader of the Indigenous People of Biafra (IPOB) Nnamdi Kanu has given condition under which he must be released. He said: "I don't think at any point, I went far… I did not go far enough and I will say more when I come out. "If you hate me, I’ll hate you more; if you love me, I love you more, I am not a pacifist,” Kanu said. It could be recalled that some notable Nigerians on Tuesday, February 28, visited the IPOB leader and three others in Kuje Prison. The group led by the former governor of CBN said the visit was in solidarity with Kanu and his co-accused – Benjamin Madubugwu, Chidiebere Onwudiwe and David Nwawuisi - who have been in detention at the Kuje Prison. Soludo also said the visit was aimed at consulting with the IPOB leader on his agitation for Biafra and the way forward in liberating and ensuring sustainable development in the South-East and South-South region. The Nzuko Umunna group also blamed the consistent agitation on the corruption ravaging the country through looting by elites who have failed to address various major issues in Nigeria.